I’ve had the Photoshop Elements 6.0 (PSE henceforth) trial installer sitting in my Downloads folder for a while now, and it’s high time I took a look at it. I’ve actually never used Photoshop Elements, although I have quite a bit of experience with the crippleware Photoshop 4.0 “Limited Edition”, which — thankfully — PSE doesn’t resemble in the slightest. So for first impressions, installation was slow and painful. The installer won’t install anything unless all Adobe apps, web browsers, and anything else they can think of are not running. This is bad enough, but it also complains about the offending programs one at a time. Quit Safari then click Try Again. Quit Photoshop and then click Try Again. And so on. Yuck. Once installed, Photoshop Elements weighs in at 427MB of which about 30MB is tutorials and documentation. That’s atrocious but par for the course these days. Pixelmator, Photoline, and Acorn are all “drag this icon to your Applications folder” to install, and “drag this icon to the Trash” to uninstall. This is how Mac software should be and generally has been since 1984. Bridge is slower than the Media Browser component that Pixelmator uses, but a lot more capable — with one glaring exception. When you try to access the iPhoto Library (which it provides a handy shortcut for) rather than behaving sensibly and letting you browse the directories within or, better yet, parse them with some knowledge as to how iPhoto structures them and conceal the garbage, it simply launches iPhoto. I might note that, knowing where iPhoto actually stores stuff is no help. If you try to sneak up on your RAW images by finding them yourself, Bridge cleverly sees what you’re trying to do and helpfully launches iPhoto instead. So, special effort went into this little Usability Fiasco. iPhoto in turn needs to be set to use PSE as its external editor and, to add insult to injury, when you double-click a RAW image in iPhoto, it sends PSE a processed JPEG to edit — bypassing Adobe Camera Raw which is pretty much the main selling point of PSE. Helpful Hint: to actually use ACR on RAW images in your iPhoto Library, you need to right-click on the Photo and choose “Show in Finder”, and then drag the document into PSE manually. Good grief. I hope Adobe fixes this idiocy in an update. OK, so we’re in PSE and we’ve managed to load a RAW image. First of all, PSE has a pretty nice looking interface. Very much inspired by Apple’s “Pro” apps (not as polished, but not bad) with dark grey panels and a lack of clutter. Sadly, not all of PSE’s interface matches this look, so you’re occasionally brought into jarring contact with vanilla Aqua dialogs (much like the way the Type and Color Picker floaters stick out like a sore thumb in Pixelmator, but worse). And, unlike Apple’s Pro apps, it doesn’t really know what to do with a second monitor. Next, PSE has some great stuff for novice users. The interface is divided into three “stages”: Edit (process and retouch images), Create (assemble albums, etc. ), and Share (distribute content). For the Edit stage there is a “full” interface (with every tool available), a “quick” interface with just the most common stuff, and a “Guided” interface which is very simple to use, and useful even for experienced users who want to make sure they haven’t forgotten something obvious. The Guided interface also reveals some of PSE’s most brilliant tools, such as its Correct Skin Tone tool which is one of the fastest and most effective color correction tools I’ve ever seen. Above, PSE has HUD-style confirmation dialogs, which I find to be an improvement over Photoshop’s interface. 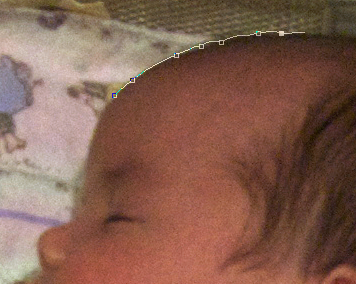 In the Full interface it took me a little while to map what I saw on to Photoshop’s toolset. At first I thought Curves was missing, but not only is it present, it comes with useful presets (e.g. correct for backlighting) whichallow novice users to see how Curves works without being thrown in the deep end. I didn’t really use the Quick interface at all, and I’m not sure it’s really all that useful since the Full interface isn’t terribly cluttered. PSE’s magnetic lasso tool tries to trace the edges of objects automagically, and does a pretty good job (this Photo was taken in appalling lighting conditions). This isn’t a huge list. I could certainly live with PSE (instead of Photoshop) in a pinch, although I’d certainly miss its bezier tools, masking, and layer organization functions. One area where PSE really pales in comparison with the Core Image-based editors is filters. On the whole, Adobe’s suite of Filters (which is starting to get a bit dated) is still probably more useful, overall, than Core Image’s basic set, but Core Image — especially as implemented in Pixelmator, but also in Acorn — has some really nice filters wrapped in a far better, more interactive interface that Adobe can’t match. While bread-and-butter filters (Gaussian Blur, Unsharp Mask) are simply quicker and more pleasant in Core Image, in some more obscure cases, such as Zoom Blur (Radial Blur in Zoom mode for Photoshop users), Core Image simply makes Adobe’s filters look amateurish. PSE’s Zoom Blur filter (which is straight out of Photoshop) hasn’t been updated since 1995 or so, and has no preview, and produces mediocre results. 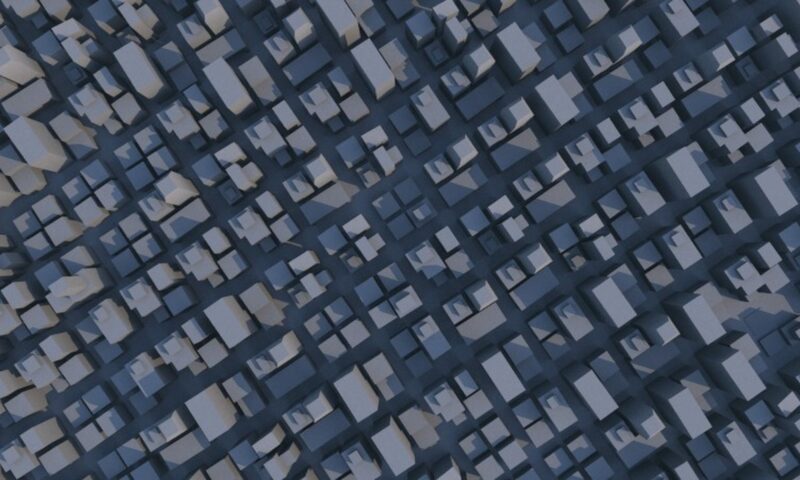 You place the center of the blur by clicking in the black and white square thingy, and then undo when you get it wrong. 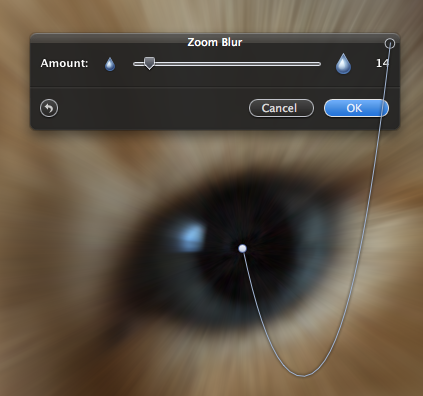 Pixelmator’s Core Image based Zoom Blur is completely interactive. 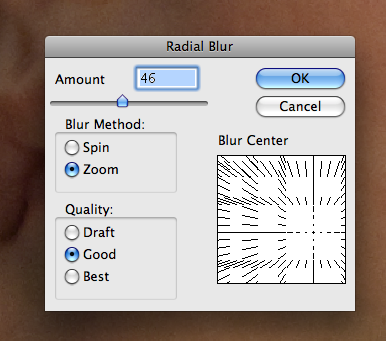 You place the center of the blur effect directly on the image, dragging the intensity results in a live, full-screen preview near instantaneously (at least on my Mac Pro, editing a full resolution image). Pixelmator feels a lot less ponderous than PSE, which might be a whole bunch cheaper than Photoshop but — launch times aside — feels considerably more sluggish. Pixelmator is also more Mac-like, and — this is a taste thing — I find it more fun to use. That said, I have Photoshop, so for me PSE is just a dumbed down version of Photoshop with some very clunky and crippled features, and a bunch of stuff I use constantly (beziers!) missing altogether. 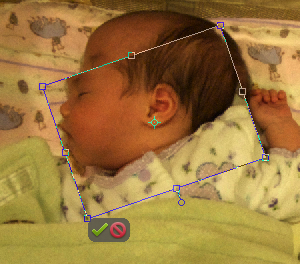 If you don’t have Photoshop and you’re a Photographer, I’d have to recommend PSE over Pixelmator. PSE has tools for photographers that Pixelmator simply can’t match, not least of which is Adobe Camera Raw (Pixelmator simply imports RAWs without allowing you to correct anything on the way in). For me, PSE has been crippled in just the right way to make it intolerable, while Pixelmator seems to me to have pretty close to the right set of features for what it does, and it’s just more pleasant to use. So, unsurprisingly, PSE offers nothing to those of us with Photoshop, but it’s pretty compelling for Photographers, if annoying to install and a bit torpid and old fashioned in places.